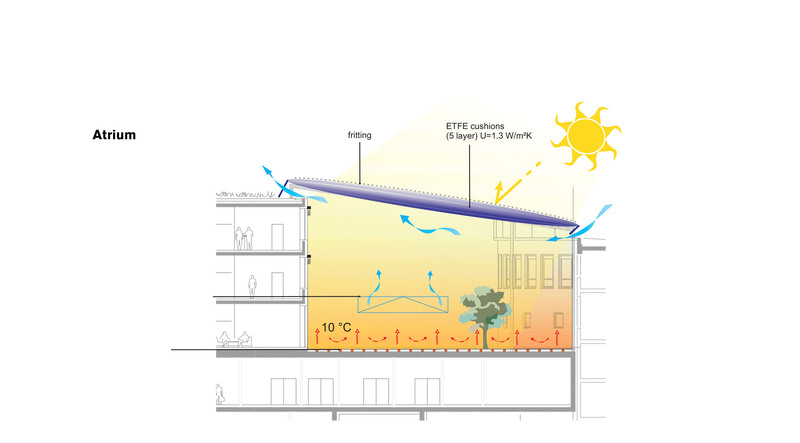 Transsolar advised on the building envelope of the cancer research center: Daylight should be able to penetrate sufficiently into the depths of the rooms but should not be blinding nor add too much heat into the building. During development of the comfort and energy concept different variants in combination with a hybrid ventilation were evaluated with the help of thermal simulations of several room types and a system comparison with the software TRNSYS. 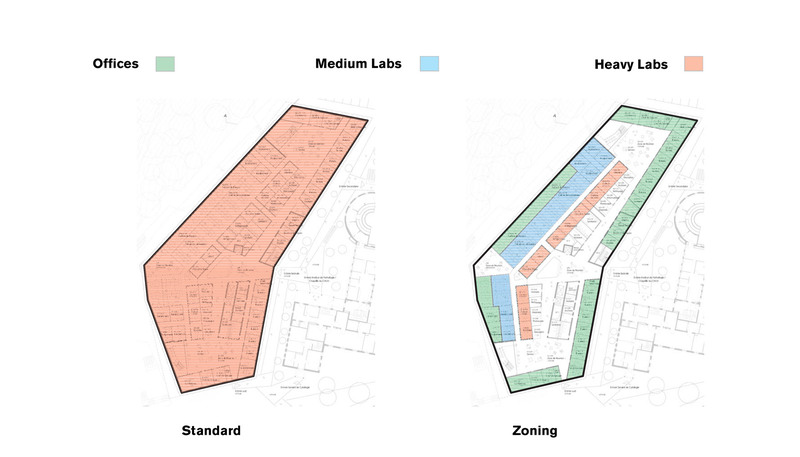 The hybrid concept treats the areas differently depending on their usage. In non-laboratory rooms, it is possible to open windows to ventilate in a natural way; the laboratory areas are supplied with air only mechanically. In addition, Transsolar extensively evaluated several energy supply strategies in terms of cost-effectiveness. 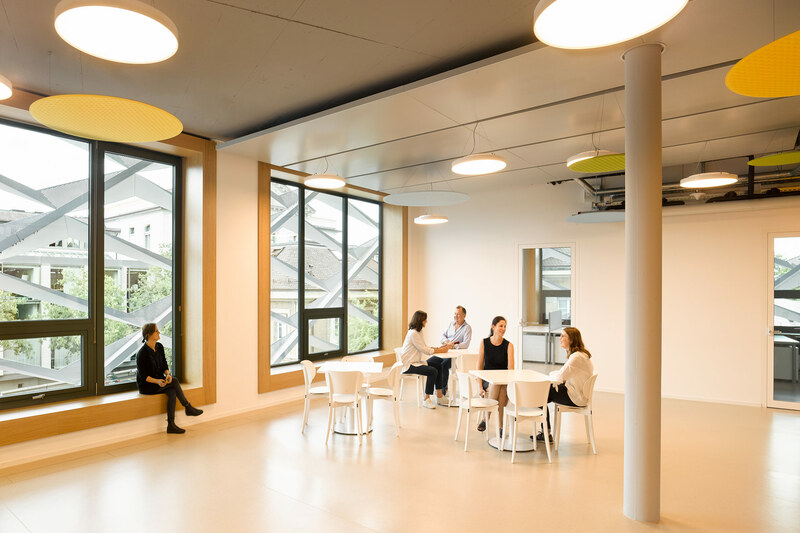 The heating and the cooling of both the offices and work areas are provided by the component activation integrated in the concrete. 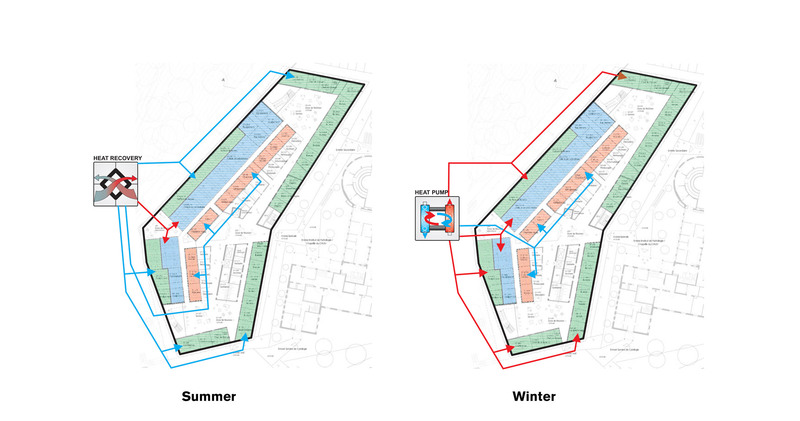 The users of these rooms can individually control their climate in the room by means of a heating element on the air outlet and operable openings in the facade. 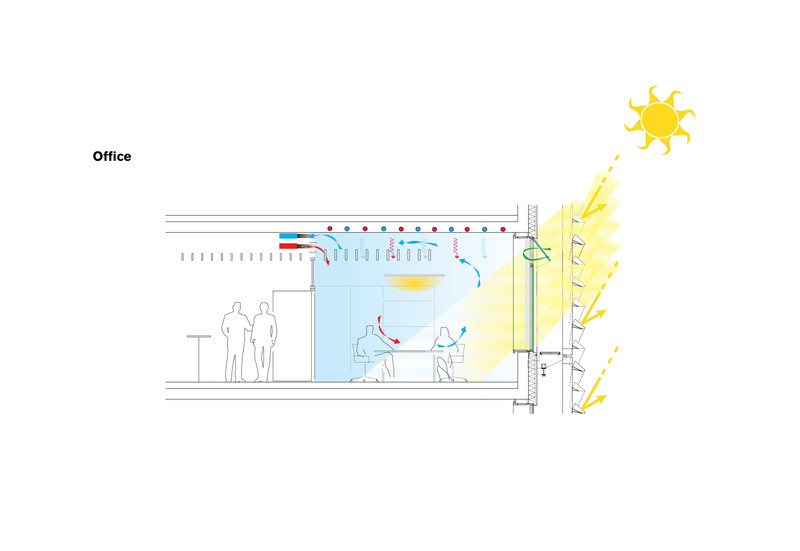 Solid, external shading protects against too much direct sunlight, but directs the light into the interior. Our parametric studies led to the final shaping of the special solid shading. 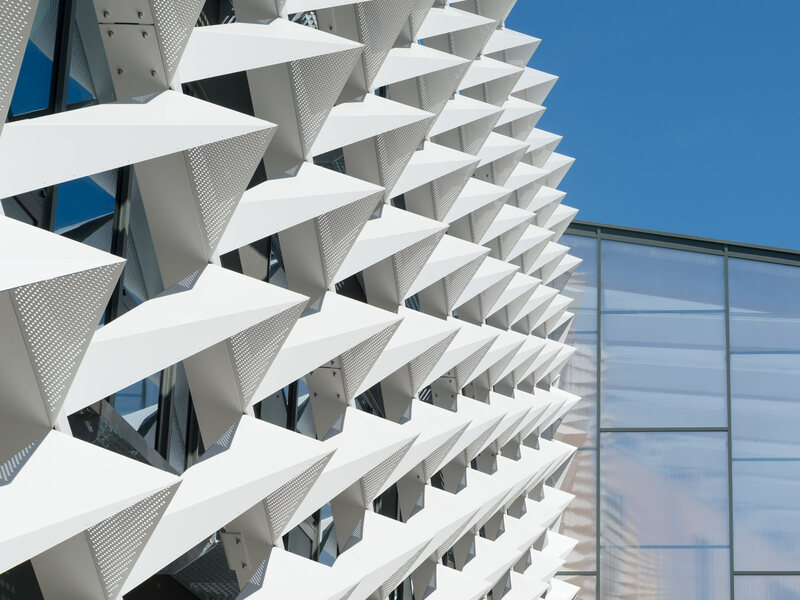 For sun exposure on the facade we carried out detailed simulations. Glazing and internal glare protection complete the protection against too much sun and heat. Natural ventilation (hybrid ventilation) of all non-laboratory rooms serves as both the supply of fresh air and night air flushing of the rooms. In all non-laboratory rooms, solid ceilings are exposed so that they can absorb thermal loads. The component activation allows mainly a low-temperature heating and high-temperature cooling. The hybrid ventilation in all non-laboratory rooms with connection to the facade reduces the need for mechanical ventilation in these areas. In the labs, mechanical ventilation is minimized to the hygienic requirements of fresh air and controlled by usage sensors. 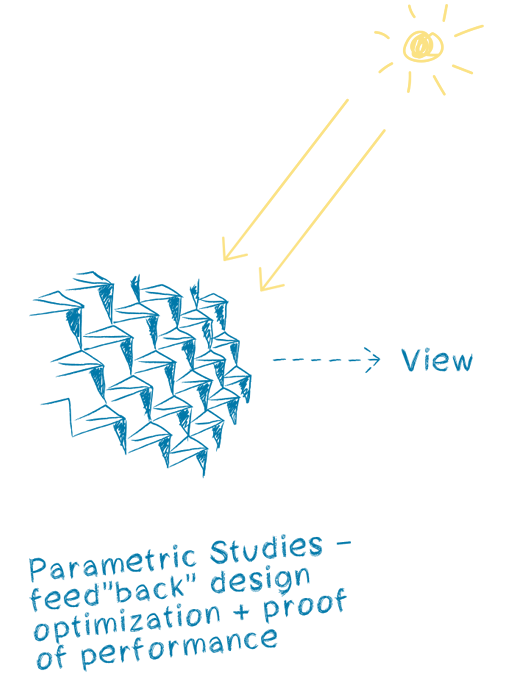 A reversible heat pump system allows synergistic heat recovery from the laboratories to the non-laboratory rooms. 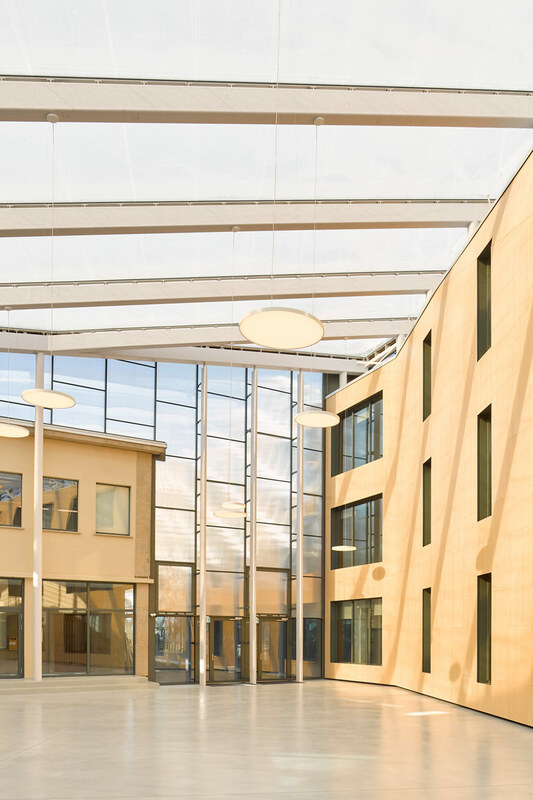 Usage of renewable and existing energy systems on-site also contributes to sustainability, so that the project resulted in a sustainable working environment.